In this second and final part of China's growing involvement in the Malaysian economy, The Straits Times looks at the major port proposals that were supposed to involve companies from China, and what is happening to them. The first part published yesterday discussed the incoming China projects and their effect on Malaysian players. Beijing's apparent support for new Malaysian ports has sparked Kuala Lumpur's optimism that it can supplant Singapore as South-east Asia's shipping hub of choice. But the main proponents of these ports are not the huge Chinese companies being talked about. Instead, they are actually cash- strapped Malaysian players hoping to secure a leg-up in efforts to expand quickly. And while Beijing is supportive of Malaysia's plan, The Straits Times understands that China's state-linked firms earmarked as partners have doubts about the viability of pouring billions into an already over-supplied sector. "Port Klang is already expanding despite not running at full capacity. It makes no sense to pursue both the Melaka Gateway and Carey Island Port so close to each other in the Malacca Strait," said former Port Klang Authority (PKA) chief Lee Hwa Beng. At least three new port projects, said to involve China and worth some RM155 billion (S$50 billion), were in the offing as of early this year. But the massive Carey Island project beside the main Port Klang in Selangor, valued at RM100 billion and which was supposed to bring in a Chinese partner, instead acquired an Indian partner during Prime Minister Najib Razak's visit to India last month. Industry and financial sources with knowledge of the plan told The Straits Times that MMC Corp, the Malaysian conglomerate proposing the deal ahead of plans for a public listing of its ports business, found China Merchants Group's (CMG) terms too demanding. "MMC can't afford to finance the project on its own. But CMG doesn't just want to be a bankroller," a source said of the port on an island next to the established Port Klang. 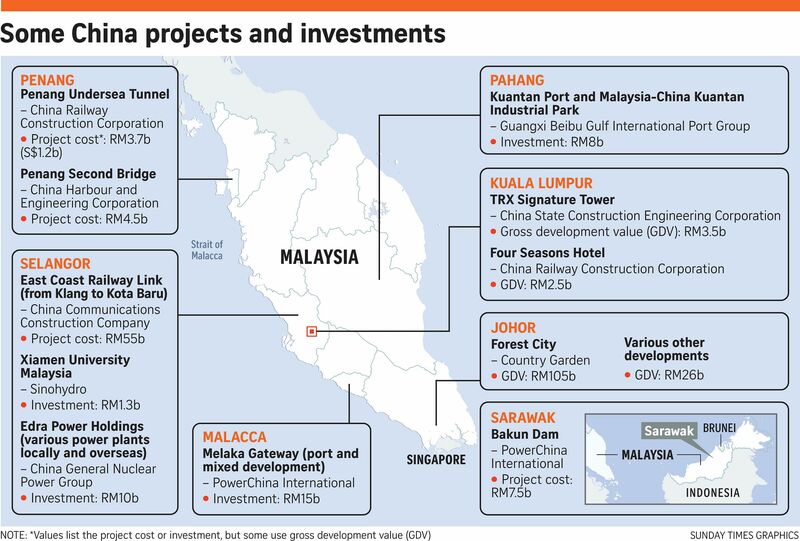 Industry players and government officials are also doubtful that the RM43 billion Melaka Gateway, spearheaded by the little-known KAJ Developments, will take off, due to uncertainty among its Chinese partners, chief of which is PowerChina International. The Chinese firms are still evaluating the potential returns from having to build the harbour on one natural island and three reclaimed ones. "In three years, they've invited ministers including the premier to several launches and signings, but are still short of a legally binding agreement," a government source told The Straits Times. It is only on Malaysia's east coast town of Kuantan in Pahang that there is a Malaysian port project which has long started work with the help of a Chinese company. The Kuantan port is being expanded at a cost of RM4 billion with the involvement of China's Beibu Gulf Port Group. For China, not only does most of its trade pass through the Malacca Strait, but also up to 80 per cent of its imports of oil and gas needed to power up its economy. This prompted then Chinese President Hu Jintao to make the "Malacca Dilemma" a key strategic issue as far back as 2003. But Malaysia is not China's only solution to securing a trade route from Europe and the Indian Ocean. Beijing has also embarked on port-and- rail, and oil-and-gas pipe links in Myanmar, Nepal, Bangladesh and Eastern Europe. Last November, Chinese cargo was successfully carried overland to Pakistan's Gwadar Port to be shipped out. "Yes, China is friendly to Malaysia now and wants stronger allies in Asean. But it also has other strategic interests, and we cannot assume Malaysian ports are its top priority," said former PKA boss Datuk Lee. Analysts also believe Beijing could be cooling its long-standing policy of funding mega projects abroad. "The Chinese government itself may now be concerned about its global image and, most importantly, about capital flight," said Dr Johan Saravanamuttu of the S. Rajaratnam School of International Studies. PETALING JAYA (SIN CHEW DAILY/ASIA NEWS NETWORK) - In the absence of accurate official explanations on the collapse of the Bandar Malaysia deal, the various speculations have since sparked tremendous market concerns. Malaysian state-owned firm TRX City said in a statement last Wednesday (May 3) that the collapse of the deal was a result of China Railway Engineering Corporation (CREC) and Iskandar Waterfront Holdings (IWH) unable to fulfill their payment obligations. However, the joint-venture company said it had performed all its payment obligations and that TRX City's accusation was unsubstantiated. There are currently two kinds of rumours circulating in the market, that Malaysia's ruling party Umno has steered a dramatic U-turn for the sake of election for fear of anti-Chinese sentiment among the Malays; and that Beijing is imposing capital control to restrict Chinese companies' investments overseas. TRX City said in the statement that the Malaysian Finance Ministry would retain 100 per cent ownership to ensure Malaysians would benefit from the development, which is consistent with the ruling party's political interests. However, as the national economy is now facing serious threats from a host of domestic as well as external factors, we need the support of funds from China more than ever. As a matter of fact, Chinese funds have indeed relieved the debt pressure of state fund 1Malaysia Development Berhad (1MDB). Moreover, Prime Minister Najib Razak has always held in very high regard the country's ties with Beijing, and is about to visit China again later this month. If the U-turn has been effectuated out of political considerations, it could leave a negative mark on the mutual trust already established between our two counties, which is not a very smart thing to do. China imposed capital control measures to restrict capital outflows as a result of the yuan falling to its lowest levels against the greenback in eight years at the end of 2016. Such a policy will invariably affect the overseas acquisitions of Chinese companies, including real estate development projects. Nevertheless, Bandar Malaysia is not just another ordinary investment. It also entails China's national interests because the project will facilitate China's bid for the Kuala Lumpur-Singapore High-Speed Rail (HSR) project. Staying away from Bandar Malaysia will risk the HSR project eventually falling into the hands of the Japanese. As such, these two guesses are not really very logical. In its stead, a report by The Star perhaps gets closer to the fact. It was reported that the abortion of the deal was due to Malaysia finding itself unable to fulfil Beijing's "shopping list" that would include an assurance on China's HSR bid, as Malaysian officers could not commit to many of the proposed terms due to national interest and social reasons. The report has explained the doubts we had, namely that Umno leaders are concerned that the issue of Chinese funds will dampen the party's chances of winning the election, while the Chinese authorities are applying pressure on Malaysia owing to the strategic importance of the KL-Singapore HSR project. The government's announcement of the deal's collapse was made in a hurried manner, otherwise Mr Najib would not have cancelled his visit to Bandar Malaysia at the last minute. The deal cancellation will nevertheless have negative impact on the country's development. 1. The 1MDB debt restructuring exercise could be at stake. An out-of-court settlement was reached between 1MDB and Abu Dhabi's International Petroleum Investment Company (IPIC) whereby 1MDB would pay IPIC US$7.01 billion (S$9.9 billion) whereas 1MDB would raise US$7.41 billion from the sale of Bandar Malaysia shares. Uncertainties surrounding 1MDB's debts will deal a severe blow on the local currency, along with Mr Najib's political risks. 2. If the issue eats into the bilateral relationship between Malaysia and Beijing, it will affect other major Chinese investments in this country, including the East Coast Rail Line (ECRL) project. It is absolutely necessary for the government to provide a clear explanation on this matter before it erodes other investors' confidence in the country. Can Mr Najib once again harness his diplomatic acumen to persuade Beijing to maintain the current cordial relationship between our two countries? 3. Given the government's past records and competency, will it be able to fully unleash the economic potentials of Bandar Malaysia, or will the project be reduced to just another white elephant? Against the backdrop of sluggish sales of KL's commercial and luxury residential units, Bandar Malaysia may not be a hen that lays the golden eggs in the absence of any value-added and innovative solution. Bandar Malaysia is one of the mega projects that will portrait the country's vision for the future. The collapse of the deal proves that mega projects will not necessarily assure the country of its future without us putting in some real effort. It appears that everything is within our grip, from 1MDB to Bandar Malaysia, but unfortunately these projects have lagged far behind the dramatic changes taking place in our world!